Laia Foundation representatives were invited to the graduation of students from Dalit communities. 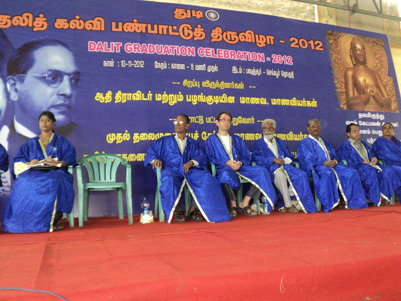 The event, which brought together all Dalit graduates in the Pavunjur area, Kanchipuram district, aimed to encourage graduates to continue their studies and emerge as role models for the younger ones. The function was organized by the NGO 'Thudi', in Tamil, which means, 'reactive sensitivity'. Support for students affected by cyclone "Thane"